After leaving the Lake Vanda field camp last Thursday I’ve spent the last 4 days at Scott Base waiting to start the long trip back to the United States. My first order of business when I got back to Scott Base was to shave and take a much needed shower. As I mentioned in my blog post about life in the field camp, we didn’t have running water so showering wasn’t possible while I was there. Another “convenience” we take for granted in our normal lives is having internet access, but at the field camp our only means of communication with the outside world was via an Iridium satellite phone, so I was completely unplugged from my work and personal e-mail for the 10 days I was at camp. Some of you may think that sounds horrible but it was actually quite freeing to be out of touch for an extended period of time, although I was able to stay in touch with the people back home I most wanted to, my wife and daughter, with short satellite phone calls. Once I was back at Scott Base I had regular access to the internet again, although the internet in Antarctica is much slower than what we are used to at home, with speeds similar to the slow dial-up internet connections common 10 or 15 years ago. With that internet access I spent a portion of my 4 days at Scott Base catching up on work e-mail, getting in touch with friends and family, and posting entries to this blog. 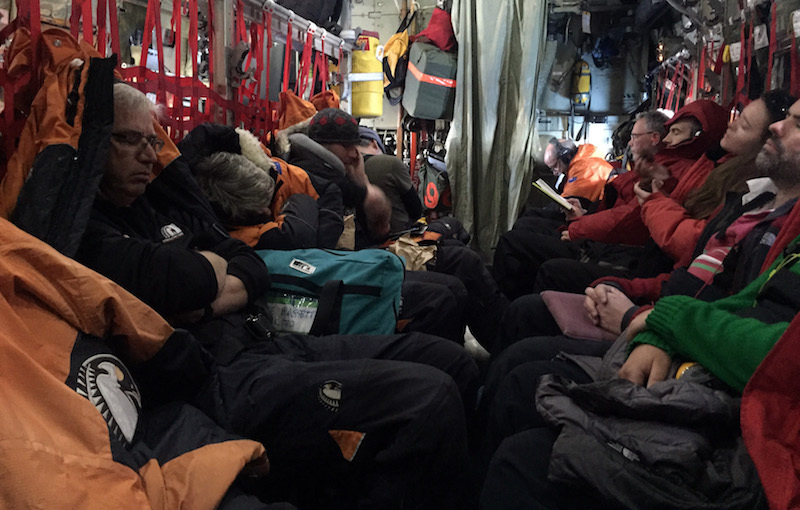 Another aspect of modern life we take for granted, but that I was remind of once I got back to Scott Base, is having a warm, soft bed to sleep in at night. While it wasn’t terribly cold at the field camp there were nights in the tent that were pretty chilly so I really appreciated being able to climb into a warm bed at the end of the day once I was back in Scott Base without having to wear multiple layers of clothes, a hat, and gloves. Because my Antarctic work had wrapped up once I left the field camp I also had quite a bit of free time during my 4 days at Scott Base. I spent some of that time reading and watching movies. One thing I really enjoy doing when I’m in Antarctica is hiking on the Ross Island trails. Because it is light outside 24 hours per day at this time of year, evening hikes, until 10 or 11PM or later, are no problem and made for a nice after dinner activity. The faint Ob Hill loop trail stretching across the volcanic rocks of Ob Hill. The sea ice covered McMurdo Sound is visible just beyond the rocky hillside. In the far distance is the Ross Ice Shelf, which doesn’t appear any different than the sea ice on McMurdo Sound at this time of year, Black Island (in the background on the right side of this photo) and Minna Bluff (center background). Early polar explorers would climb Ob Hill (short for Observation Hill) to look south for the return of their companions from trips onto the Ross Ice Shelf or to the north for the return of the ships that would take them back to civilization. I like these evening hikes, in part, because they give me an opportunity to get away from everyone on the base. On of the surprising aspects of visiting Antarctica, the least populous continent, is that you are almost always with other people when you are here. You share a dorm room with one or more people and there is always someone around wherever you go on base. Also, there is always some sort of mechanical noise either from heavy equipment used to move cargo, helicopters flying into or out of the base, or the power and heating plants running on station. 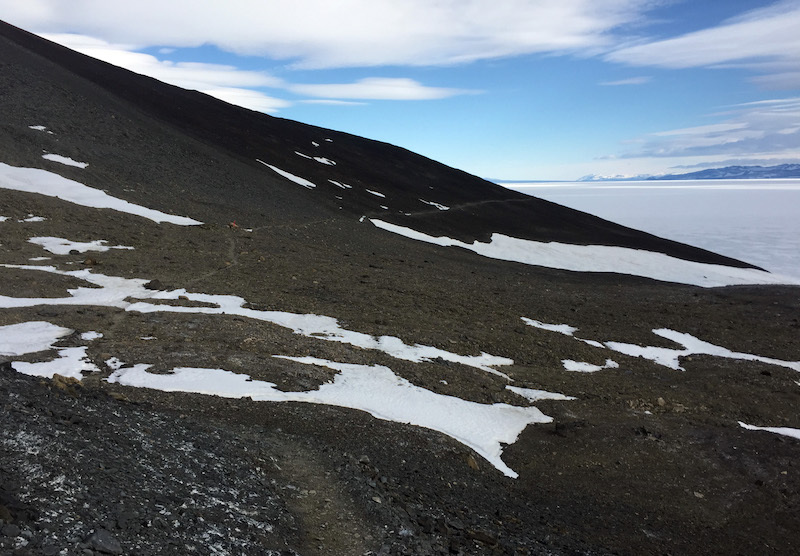 The Ob Hill loop is nice because it loops around a 1000 foot tall volcanic cone between McMurdo Station and Scott Base. On the backside of this loop the hill shields you from all of the noise from both McMurdo and Scott Base giving a rare bit of complete silence. It really is a lovely way to spend a few hours of an Antarctic day. Another surprising aspect of life in Antarctica is that when you are on station you spend almost all of your time inside. It is easy to picture Antarctica as a vast, open wilderness – and it is – but for much of the time you are on base you are not outside. This is especially true at Scott Base, where all of the base buildings are connected and you never need to go outside. In McMurdo the dorms, galley, and science buildings are all separate, so you do go outside several times a day just in your normal course of activities. As a result, both the United States and New Zealand Antarctic programs make an effort to provide lots of recreational opportunities for people to get outside. The Ross Island trail system is one example of this. Both stations also have a variety of outdoor gear that can be borrowed including skis and mountain and fat bikes. I’m an avid cyclist at home, riding almost every day of the year, so when I’m in Antarctica I miss my normal daily bike ride. 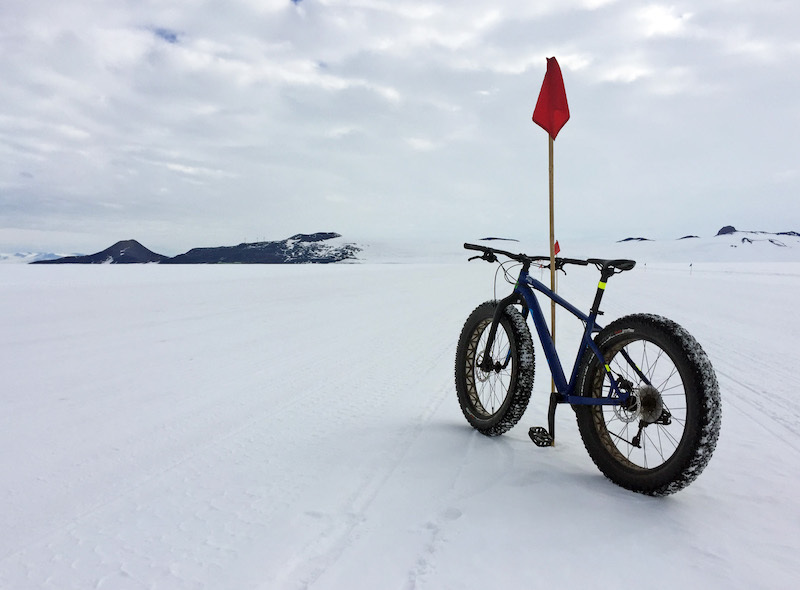 Over the last few days I was able to borrow one of the Scott Base fat bikes (just a mountain bike with extra wide tires to provide flotation on soft surfaces like snow) and ride on the snow road on the Ross Ice Shelf out to the runway. The road is completely flat, so other than a bit of wind and cool temperatures, the riding is very pleasant. My fat bike leaning against a flag that marks the snow road. Scott Base is at the left end of the dark volcanic Hut Point Peninsula in the background. The dark conical hill on the left side of this photo is Ob Hill. 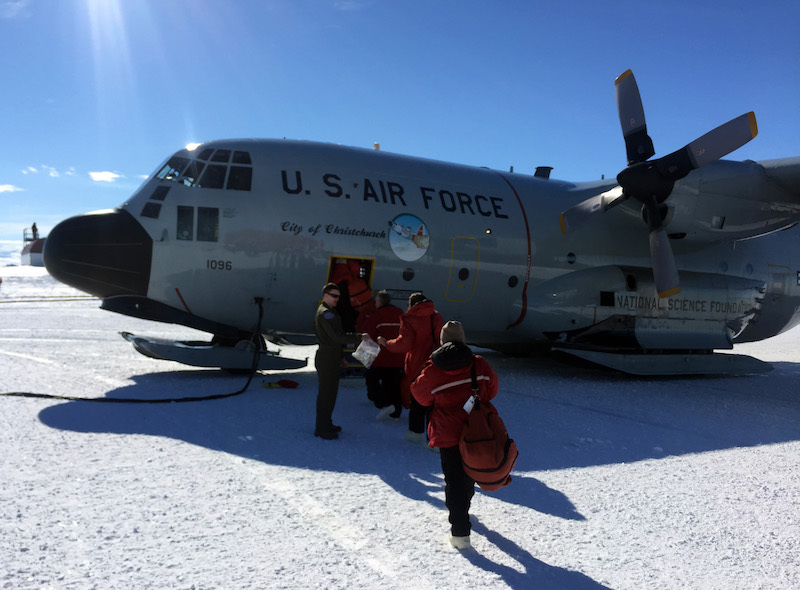 My 14th trip to Antarctica ended today when I flew from the William’s Field snow runway, about 5 miles from Scott Base, to Christchurch, New Zealand on a ski-equipped LC-130 military transport plane. 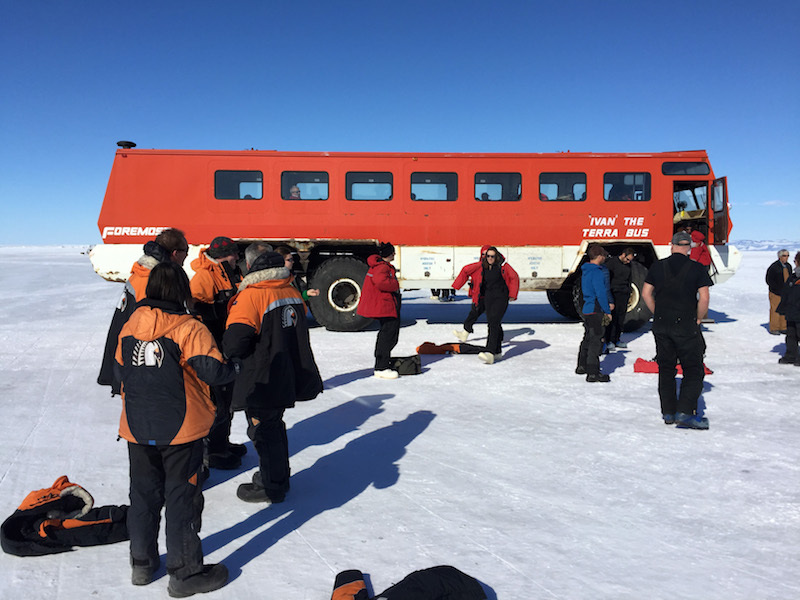 The almost 40 passengers on this flight were driven from McMurdo Station and Scott Base in a large bus called the Terra Bus. Passengers outside of Ivan the Terra Bus at the Williams Field snow runway waiting to board their flight to New Zealand. Boarding the ski-equipped LC-130 transport plane at Williams Field for the flight back to Christchurch. Flights to and from Antarctica are far from comfortable. The seats are nylon webbing over an aluminum frame and you sit knee to knee with the person across from you. It is also very loud inside the plane and everyone wears either ear plugs or noise cancelling headphones so you can’t talk with your fellow passengers during the 8 hour flight. Most people pass the time on board by reading or sleeping. Passengers passing time during the 8 hour LC-130 flight from Antarctica to New Zealand. I arrived in Christchurch at 10:30PM. Upon stepping off of the LC-130 I saw my first dark sky in over 2 weeks. Just as I love that first moment of stepping out of the LC-130 into the wide open Antarctic landscape on my flights down to the continent I also love that first step out into the dark New Zealand night. That first moment is a rush of new senses – seeing the night sky, feeling the warmth of a summer evening, and smelling the moisture in the air and the scent of green vegetation. I’ll be spending a few days in New Zealand before flying home. My return flight to the US is booked for February 3rd, but I’ll try to get home sooner than that if I can rebook my airline ticket. This will be my last blog post of this trip, but I’ll be returning to Antarctica in a few months for a research cruise. I’m planning to post new blog entries during that trip. Until then, I’ll end this trip’s blog posts with a few videos from my time in Wright Valley. This video shows the view from our helicopter as we took off from Scott Base. There are a couple of seals (they look like big slugs) laying on the sea ice just past the helopad in the first few seconds of this video. After that you can see the smoking cone of Mt. Erebus, the southernmost active volcano in the world. The next portion of the video shows us approaching the Transantarctic Mountains and then flying into the mostly ice free Wright Valley. The video ends with the helicopter approaching the ice covered Lake Vanda and landing at the Lake Vanda field camp. This video shows a SUMO UAV launch and landing. For the launch, Marwan throws the SUMO into the air while I control it with a remote control. For the landing I fly the plane onto the sandy bank of the Onxy River where the SUMO lands on its belly. This video shows an MTD UAV launch and landing. Here, Dion throws the MTD while Marwan controls it with a remote control during the launch. Just like the SUMO, the MTD also lands under manual control and does a belly landing on the sandy edge of the Onyx River. The larger MTD UAV is able to carry a bigger payload than the SUMO UAV, and is equipped with a forward facing video camera. This video shows two circular orbits of the MTD, one just after take-off and the second at almost 3000 feet above the valley bottom. The video ends with the MTD landing on the sandy valley bottom. I hope you’ve enjoyed reading this blog. During January the sun did not set while I was at the Lake Vanda Camp. Instead, the sun circled the sky, being highest in the sky (about 30 degrees above a flat horizon) at noon when it was to north and lowest in the sky (about 8 degrees above a flat horizon) at midnight when it was to the south. Because the Wright Valley, where our camp was located is a relatively narrow valley with tall, steep valley walls the sun would go behind the southern valley wall at night leaving our camp, and valley, in shadow for several hours each night. With the sun following a relatively shallow arc across the sky it was low in the sky for much of the day and did cast long shadows.